Cracow Industrial Society has been organising the Last Night of the Proms in Cracow since 1996. Initially, the concert was conducted by Jerzy Maksymiuk, who first conducted the Orchestra of the Polish Radio in Cracow and later on, since 1999, the National Polish Radio Symphony Orchestra in Katowice. In 2001 the NPRSO was conducted by Robin Page, in 2002 by Jonathan Del Mar, and from 2003 to 2008 the Orchestra performed under the baton of Mark Fitz-Gerald. From 2009 the Beethoven Academy Orchestra was conducted three times by Mark Fitz-Gerald, in 2012 by Gabriel Chmura, from 2013 to 2015 by Daniel Smith, in 2016 by Jacek kaspszyk and in 2017 by Lee Reynolds. Numerous outstanding soloists have performed in the concerts to date: Elżbieta Karaś, Agnieszka Kurowska, Bożena Zawiślak-Dolny, Monika Swarowska-Walawska, Karol Radziwonowicz, Anna Bajor, Tatiana Szebanowa, Jan Paweł Nowacki, Julian Gembalski, Kaja Danczowska, Elżbieta Towarnicka, Waldemar Malicki, Monika Walerowicz-Baranowska, Maciej Grzybowski, Alison Pearce, Edyta Piasecka, Kuba Jakowicz, Przemysław Firek, Dave Lee, Arkadiusz Bialic, Michał Marzec, Rafał Songan, Łukasz Kuropaczewski, Iwona Sobotka, Haik Kazazian, Sally Wilson, Mariusz Patyra, Tomasz Kuk, Ole Edvard Antonsen, Iwona Hossa, Øystein Baadsvik, Christian Lindberg, Hanna-Elisabeth Müller, Kevin Kenner, Iwona Socha, Martin Fröst, Magdalena Bojanowicz, Andeka Gorrotxategui, Urška Arlič Gololičič, Delia Stevens, Maria Forsström, Piotr Orzechowski, Anne Akiko Meyers, Magdalena Molendowska, Joanna Freszel and Denis Shapovalov. The 22nd Last Night of the Proms in Cracow took place on 16 September at the Cracow Opera House. Performers: Joanna Freszel - soprano, Denis Shapovalov - cello, electric cello (Russia), Beethoven Academy Orchestra and the Krakow Opera Choir under the baton of Lee Reynolds (UK). The 21st Last Night of the Proms in Cracow took place on 10 September at the Cracow Philharmonic Hall. Performers: Anne Akiko Meyers – violin (USA), Magdalena Molendowska – soprano, Beethoven Academy Orchestra and the Górecki Chamber Choir under the baton of Jacek Kaspszyk. The 20th Last Night of the Proms in Cracow took place on 12 September at the Cracow Philharmonic Hall. Performers: Iwona Sobotka - soprano, Maria Forsström - mezzo-soprano, Piotr Orzechowski 'Pianohooligan' - piano, Beethoven Academy Orchestra and the Górecki Chamber Choir under the baton of Daniel Smith. The 19th Last Night of the Proms in Cracow took place on 13 September at the Cracow Philharmonic Hall. Performers: Urška Arlič Gololičič - soprano, Delia Stevens - percussion, Beethoven Academy Orchestra and the Górecki Chamber Choir under the baton of Daniel Smith. The 18th Last Night of the Proms in Cracow took place on 14 September at the Cracow Philharmonic Hall. Performers: Magdalena Bojanowicz – cello, Andeka Gorrotxategui - tenor, Beethoven Academy Orchestra and the Cracow Philharmonic Choir under the baton of Daniel Smith. The 17th Last Night of the Proms in Cracow took place on 8 September at the Cracow Philharmonic Hall. Performers: Iwona Socha – soprano, Martin Fröst - clarinet, Beethoven Academy Orchestra and the Cracow Philharmonic Choir under the baton of Gabriel Chmura. The 16th Last Night of the Proms in Cracow took place on 10 September at the Cracow Philharmonic Hall. Performers: Hanna-Elisabeth Müller – soprano, Kevin Kenner - piano, Beethoven Academy Orchestra and the Cracow Philharmonic Choir under the baton of Mark Fitz-Gerald. The 15th Last Night of the Proms in Cracow took place on 11 September at the Cracow Opera. Performers: Sally Wilson – mezzo-soprano, Christian Lindberg – trombone, Beethoven Academy Orchestra and Krakow Opera Choir under the baton of Mark Fitz-Gerald. The 14th Last Night of the Proms in Cracow took place on 5 September at the Cracow Philharmonic Hall. Performers: Iwona Hossa – soprano, Øystein Baadsvik – tuba, Beethoven Academy Orchestra and the Polish Radio Choir in Cracow under the baton of Mark Fitz-Gerald. The 13th Last Night of the Proms in Cracow took place on 20 September at the Cracow Philharmonic Hall. Performers: Tomasz Kuk – tenor, Ole Edvard Antonsen – trumpet, the National Polish Radio Symphony Orchestra in Katowice and the Cracow Philharmonic Choir under the baton of Mark Fitz-Gerald. The 12th Last Night of the Proms in Cracow took place on 8 September at the Cracow Philharmonic Hall. Performers: Sally Wilson – mezzo-soprano, Mariusz Patyra – violin, the National Polish Radio Symphony Orchestra in Katowice and the Cracow Philharmonic Choir under the baton of Mark Fitz-Gerald. The 11th Last Night of the Proms in Cracow took place on 9 September at the Cracow Philharmonic Hall. Performers: Iwona Sobotka – soprano, Haik Kazazian – violin, the National Polish Radio Symphony Orchestra in Katowice and the Cracow Philharmonic Choir under the baton of Mark Fitz-Gerald. The 10th Last Night of the Proms in Cracow took place on 10 September at the Cracow Philharmonic Hall. Performers: Łukasz Kuropaczewski – guitar, Michał Marzec – tenor, Rafał Songan – baritone, Przemysław Firek - baritone, the National Polish Radio Symphony Orchestra in Katowice and the Cracow Philharmonic Choir under the baton of Mark Fitz-Gerald. The 9th Last Night of the Proms in Cracow took place on 6 November at the Cracow Philharmonic Hall. Performers: Przemysław Firek – baritone, Dave Lee – horn, the National Polish Radio Symphony Orchestra in Katowice and the Cracow Philharmonic Choir under the baton of Mark Fitz-Gerald. The 8th Last Night of the Proms in Cracow took place on 4 September at the Cracow Philharmonic Hall. Performers: Edyta Piasecka – soprano, Jakub Jakowicz – violin, the National Polish Radio Symphony Orchestra in Katowice and the Polish Radio Choir in Kraków under the baton of Mark Fitz-Gerald. The 7th Last Night of the Proms in Cracow took place on 14 September at the Cracow Philharmonic Hall. Performers: Alison Pearce – soprano, Maciej Grzybowski – piano, the National Polish Radio Symphony Orchestra in Katowice and the Polish Radio Choir in Kraków under the baton of Jonathan Del Mar. The 6th Last Night of the Proms in Cracow took place on 15 September at the Cracow Philharmonic Hall. Performers: Monika Walerowcz-Baranowska – mezzo-soprano, Waldemar Malicki – piano, the National Polish Radio Symphony Orchestra in Katowice, Polish Radio Choir in Kraków and the Madrigal Singers of Cappella Cracoviensis under the baton of Robina Page. The 5th Last Night of the Proms in Cracow took place on 16 September at the Cracow Philharmonic Hall. The 4th Last Night of the Proms in Cracow took place on 19 September at the Cracow Philharmonic Hall. The 3rd Last Night of the Proms in Cracow took place on 28 August at the Cracow Philharmonic Hall. Performers: Anna Bajor – soprano, Bożena Zawiślak Dolny – mezzo-soprano, Tatiana Szebanowa – piano, the Polish Radio Orchestra in Kraków, Polish Radio Choir in Kraków and the Madrigal Singers of Cappella Cracoviensis under the baton of Jerzy Maksymiuk. The 2ed Last Night of the Proms in Cracow took place on 19 September at the Cracow Philharmonic Hall. Performers: Monika Swarowska-Walawska – soprano, Karol Radziwonowicz – piano, the Polish Radio Orchestra in Kraków, Polish Radio Choir in Kraków and the Madrigal Singers of Cappella Cracoviensis under the baton of Jerzy Maksymiuk. 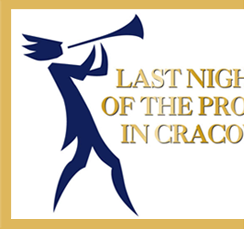 The 1st Last Night of the Proms in Cracow took place on 28 September at the Juliusz Słowacki Theatre.